Automatic Auger type Powder filling machine is precision built on sturdy welded MS frame completely enclosed in stainless steel sheet and doors are provided to facilitate the servicing of machine. The unit is made compact, versatile and enclosed in stainless steel elegantly matt finish body. The dried, sterilized and siliconised bottles are fed through the infeed Turn Table on the infeed SS/Delrin conveyor belt at the required speed for feeding. When bottle reaches under the filling head, it is held by the pneumatic bottle holder. Immediately it is be sensed by the bottle sensor and gives signals to magnetic clutch to start to rotate which is mounted on auger shaft. 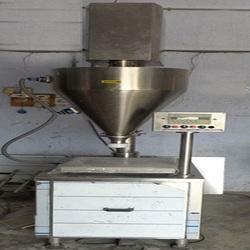 It will fill the desired amount of powder to the bottle through auger, where rotation time is set in the Timer. After filling of first bottle pneumatic bottle holder releases the first bottle to move on conveyor for next operation. Food Powder Filling Machines offered comes backed by latest technology support so as to match up with the precise packaging requirements of cosmetic powder. 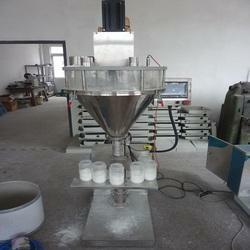 The industry sectors these find use in include chemical industry, foodstuff industry and others. Some of its features include suitable for packaging of cosmetic powder, medical powder and others; advanced air return design for minimum dust; discharging organ provided for medium package; can be provided with optional support as demanded by customers. With sincere intentions to preserve and uplift our reputation in the market, we bring forth a distinguished assortment of Powder Filling Machine which finds suitability for automatic filling and adjusting requirements for delivering optimum powder packing working environment. Our machine comes with advanced photoelectric control as well as synchronous motor support so as to efficiently handle the operation demands. Offered machine is known for its advance featured like filling system driven by step motor for achieving high weighing precision & touch screen display support for easier process handling. Electrical Specifications Main Machine 1.50 HP / 415Volts / 50 Hz. Manual Powder Filling Machine offered come supported by electronic sensor control and finds suitability for handling powder filling requirements of different processed materials and packaging specifications as demanded by the customers. Further, the machine is developed to deliver high precision working and longer service life. 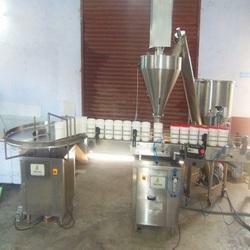 Some of its features include digital display support for easier operation of the machine, allows storage of different adjustment parameters; provides for hig packaging accuracy; servo motor based drive mode and others.Semi Automatic Auger Type Powder Filling Machine is precision built on sturdy welded MS frame completely enclosed in stainless steel sheet and doors are provided to facilitate the servicing of machine. The unit is made compact, versatile and enclosed in stainless steel elegantly matt finish body. 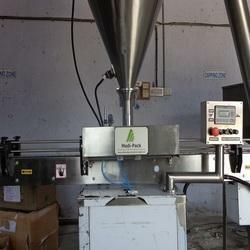 Automatic powder filling machine offered comes backed by PLC and frequency control so as to offer precise operations. Further, it comes with precision cam meter control as well as in stainless steel finish in compliance with GMP standards. Some of its features include suitable for small doses of powder filling operations, suitable for use in industry sectors like food, pharmaceutical, chemical and others; full compliance with GMP requirements, advanced PLC control for precise operation support and others. Auger Powder Filling Machine offered comes in stainless steel 304 grade construction finish and meets the requirements of high efficiency as well as cost-effective performance. Further, its user-friendly operation interface also allow for stable operations. 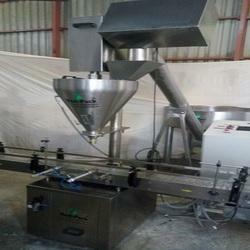 Some of its feature includes high efficiency operation support, packing speed of 50 to 80bags per minute, suitable for packing milk powder, seasonings, granulated products and others; comes with automatic computer control for high working performance; offers perfect sealing support and avoids leakage and dampness. 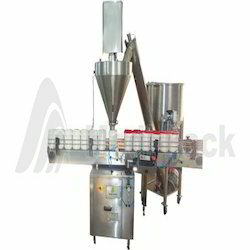 Semi Augur Filling Machine offered comprises specialized filling machine range that finds suitability for meeting the filling requirements of powders, liquids, and semi-solids. Further, these systems can handle powder filling requirements from 2 Gms to 100 Gms with different output capacities depending on fill volume and container neck diameters. Some of its features include high filling accuracy of ± 3 %, electrical rating of 1.5 HP, coming precision built on sturdy welded MS frame for optimum performance, can be provided with single/multiple head support among others.Semi Automatic Auger Type Powder Filling Machine is precision built on sturdy welded MS frame completely enclosed in stainless steel sheet and doors are provided to facilitate the servicing of machine. The unit is made compact, versatile and enclosed in stainless steel elegantly matt finish body. 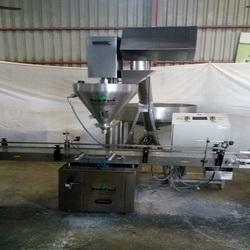 Facilitated by technically advanced process, we are presenting a distinguished collection of Homeopathic Powder Filling Machine that has high filling accuracy due to unique design features. This machine is featured by latest technology support and meets the requirements of precise functioning as well as easier process handling as demanded by the customers. 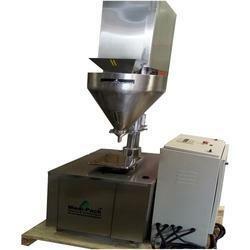 The offered machine is used for packing materials like coffee powder, henna, flour and baking powder. protine Powder Filling Machine offeredfind suitability for meeting the demands of measuring and packing granule and powdery materials like milk powder and others. Further, the system comes protected with safety protection and makes use of intelligent temperature controlling machine so as to offer accurate temperature control. Some of its features include PLC servo system for accurate functioning, pneumatic control system and touch screen support, come with error indication support for handling the issues immediately, single-belt transportation support, can support multi-line vertical automatic packing material.